Amazon.com Inc. has declined to comment on a report that it’s looking to open thousands of Amazon Go cashierless convenience stores over the next few years. Citing unnamed sources, Bloomberg said yesterday that Seattle-based Amazon is mulling plans to open as many as 3,000 Amazon Go locations by 2021. That would include having about 10 Amazon Go stores by the end of 2018 and expanding to approximately 50 in key metropolitan markets next year, according to the report. “We don’t comment on rumors or speculation,” an Amazon spokesperson said in a statement late Wednesday. Bloomberg also reported Thursday that the cost of the large-scale Amazon Go expansion could run as much as $3 billion, based on estimates by Morgan Stanley analyst Brian Nowak. The e-tail giant currently has four Amazon Go stores: three in Seattle and one in Chicago, which opened on Monday. 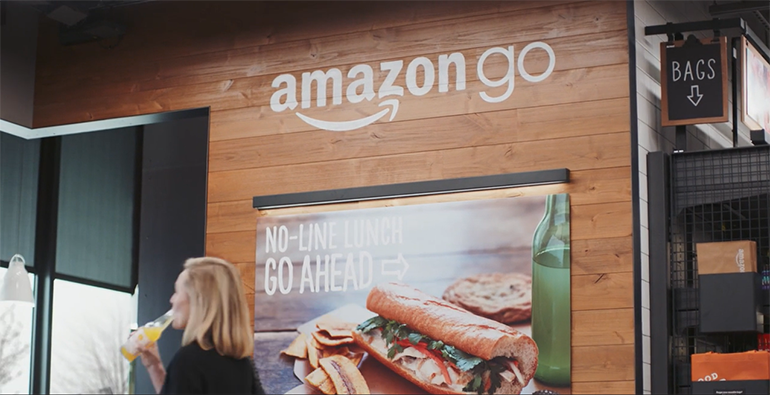 Though not giving a timetable or location details, Amazon also has confirmed plans to open Amazon Go outlets in San Francisco and New York City. Whatever Amazon ultimately plans in rolling out Amazon Go, retailers of all stripes are already keeping a close watch. Amazon Go stores blanketing major metro markets would likely take a bite out of food and beverage sales at supermarket, drug, dollar, convenience and mass chains as busy consumers — especially the burgeoning ranks of Amazon Prime members — opt for a no-waiting-in-line experience to make a quick snack, meal or grocery purchase. Industry analysts note that Amazon is increasingly embracing an omnichannel strategy for its retail business and, on the food side of the equation, would likely seek more physical stores to compete with the brick-and-mortar presence of leading grocery retailers like Walmart, Kroger, Albertsons Cos., Target and Costco. Whole Foods Market, acquired by Amazon in August 2017, currently has 470 stores in 42 states and the District of Columbia. Amazon’s flair for innovation and consumer acumen raise the potential for a major expansion of the Amazon Go format, according to Loop Capital analyst Andrew Wolf. Amazon opened the first Amazon Go, an 1,800-square-foot unit in Seattle, to employees in 2016 and to the public on Jan. 22 of this year. The store carries primarily food and beverages, although nonfood items like batteries and over-the-counter medicine also are available. Food offerings include ready-to-eat breakfast, lunch, dinner and snack options made by the company’s chefs and local kitchens and bakeries. On the grocery front, the mix ranges from essentials such as bread and milk to artisan cheeses and locally made chocolates. Also offered are chef-designed Amazon Meal Kits, which the company said enable consumers to make a meal for two in about 30 minutes. Amazon is experimenting with assortments and sizes as it opens the Amazon Go locations. For example, the second store, a 1,450-square-foot outlet opened on Aug. 28 in downtown Seattle, has largely the same cashierless, food- and beverage-focused shopping experience as the first location but with a narrower selection. Its more limited grocery assortment excludes staples like bread and milk and sells beer and wine but not liquor. Food offerings include convenience-store mainstays like snacks and drinks along with ready-to-eat, to-go breakfast, lunch, dinner and snack options. Fresh prepared foods, however, are supplied via an off-site Amazon facility rather than an in-store kitchen. The most recent Amazon Go stores are more like the first in terms of size and offerings. The third location, opened on Sept. 4 in Seattle, is the largest so far at 2,100 square feet. Meanwhile, the 2,000-square-foot Chicago store marks the first Amazon Go outside Amazon’s hometown of Seattle. Driving Amazon Go’s checkout-free shopping experience is Amazon’s “Just Walk Out” technology. Overhead cameras, weight sensors and deep learning technology detect merchandise that shoppers take from or return to shelves and keep track of the items selected in a virtual cart. Shoppers use the Amazon Go mobile app to gain entry to the store through a turnstile. When customers leave the store, the Just Walk Out technology automatically debits their Amazon account for the items they take and then sends a receipt to the app.